Feels like I won the chicken lottery when shopping for Live Below the Line this year. After struggling to balance a £10 budget to feed 2 people for 5 days last year, the actual shopping was much quicker this time, even though I still spent ages working out what on earth to buy. I stalked the yellow-stickered section in Sainsbury’s on a couple of visits, and carried off dented and hence reduced tins of Sainsbury’s Basics potatoes (down to 9p) and peeled tomatoes (down to 24p). I already knew Iceland was likely to sell the cheapest eggs, so it was my first stop the day before starting Live Below the Line, and boy did it turn up trumps. Faced with spending £1 on either 6 free range eggs or 12 caged eggs, I sold any principles down the river and bought a dozen. Canned chickpeas were a whole 2p cheaper than elsewhere at 35p, and Iceland also seemed to do the cheapest bags of onions, carrots and bananas, so I could use part of the contents for less than buying them individually. 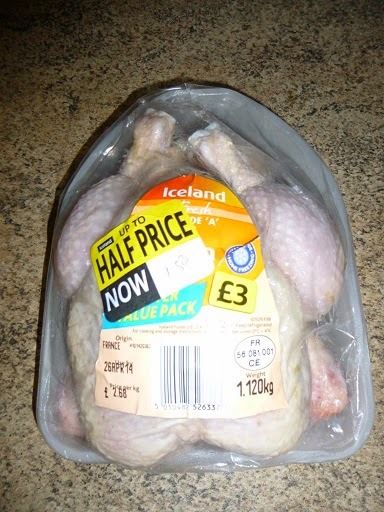 However, I nearly danced in the aisles when I discovered a chicken in the chiller cabinet reduced to half price at £1.50, rather than the £3 I’d expected. Suddenly visions of value tea bags, jam and fresh milk became a possibility. I decided to blow a whole pound on a 900g bag of Iceland frozen mixed vegetables, over excited at this luxurious version which added sweetcorn and green beans to all the carrots and peas, rather than boring cauliflower in the cheapo 75p alternatives. Iceland also seemed to match pretty much the lowest prices for butter (£1 for 250g) and fresh milk (£1 for 2.272 litres). The local supermarket a few doors down sold garlic by weight (whole bulb for 11p, rather than 30p for a single bulb at Sainsburys/Tesco/ASDA), plus 19p for a lemon and the tiniest 70g tin of tomato puree for pizza topping at 29p. The rest of the food specifically for Live Below the Line came from a late night trip to ASDA, driven entirely by the desire to buy Allinson Easy Bake Yeast at 28p for two 7g sachets. Everywhere else only seems to sell bigger packs for more money. Otherwise, ASDA Smartprice food prices basically match the Tesco Value range for anything else I wanted to buy, and both are cheaper than Sainsbury’s Basics. So I made a pilgrimage to the Stamford Hill ASDA, only to find they didn’t sell the 28p yeast sachets and the cheapest was 64p for 125g. Bugger. However, I plodded round the rest of the deserted aisles, and scrabbled around on the floor to reach the back of the bottom shelves for Smartprice brown bread (45p for 800g), plain flour (45p for 1.5kg), rice (40p for 1kg), tea bags (27p for 80), dried mixed herbs (25p for 18g) and morale-boosting strawberry jam (29p for 454g). There weren’t any Smartprice apples left, but I got a cheap bag of Braeburns instead (6 for £1, would need to work out later how many I can lever into the budget). I also recklessly spent 45p on a little 125g packet of Great Scott Scotch broth mix, with pearl barley, split peas and red lentils. Weirdly, a pack of 10 ASDA Smartprice cheese singles was 63p for 170g, while the normal ASDA pack of 20 next to it was labelled as 50p for more than twice as much, at 400g. The man at the till couldn’t believe it either when he checked the prices, but it still came up as 50p for 400g so I triumphantly carried off actual ASDA cheese slices, rather than the Smartprice version. This was a great relief in more ways than one, as I discovered that Smartprice cheese singles only actually contain 11% cheese and even the normal ASDA version only claims to be 60% cheese. After yeast disappointment and cheese confusion I headed home, and decided to raid my store cupboard for the odd few additions, and deduct the relevant money from the Live Below the Line budget.